A 45-year-old, right-hand dominant, diabetic female presents with one day of right index finger swelling and pain. She is two weeks status-post right index and middle finger trigger release. In the ED, she is febrile to 101 degrees Fahrenheit, and her exam is notable for fusiform swelling of the digit which is held in flexion. She has pain with passive ROM and tenderness along the flexor tendon. Figure 2. Plain radiograph of the hand. What is the most sensitive and specific finding to diagnose pyogenic flexor tenosynovitis? A. Finger held in flexion. B. Pain along the flexor tendon sheath. C. Fusiform swelling of the digit. D. Pain with passive extension. Trick question! It's actually none of the above. Read on to find out why. Flexor tenosynovitis consists of inflammation of the flexor tendon and its synovial sheath. The synovial sheath is comprised of both a visceral layer that adheres to the tendon and an outer parietal layer. Inflammation can lead to accumulation of fluid in this potential space and, when infection is the inciting etiology, the condition is called pyogenic flexor tenosynovitis (PFT). PFT is a surgical emergency – it can lead to substantial morbidity, such as loss of function, tendon necrosis or rupture, deep space infection, and amputation. The prevalence of PFT is estimated at 2.5 - 9.4% of all hand infections (1, 2). Figure 3. Flexor tendon sheaths of the hand. There are many anatomic variations to the flexor tendon sheath anatomy, but common themes exist. In the fingers, the distal sheaths terminate at the insertion of the FDP (near the DIP joint). In the thumb, the sheath terminates at the insertion of the FPL (near the IP joint). For digits 2-4, the sheaths commonly extend just proximal to the A1 pulley (near the MCP joint). The small finger and thumb sheaths typically communicate with the ulnar and radial bursae, respectively. As a result, infection can spread from the little finger to the thumb, or vice versa, leading to the development of a horseshoe abscess. Other notable risk factors are immunocompromised and intravenous drug use. In addition to PFT, the differential diagnosis for a red, swollen digit(s) or hand includes felon, herpetic whitlow, cellulitis, abscess, septic arthritis, gout, and pseudogout. Although Kanavel’s signs are the hallmark for clinical detection of PFT, no studies have validated their sensitivity and specificity, and there is no consensus among studies regarding which sign is most predictive of PFT (5, 6). It is important to remember that a negative exam does not rule out PFT, so if we cannot rely solely on Kanavel’s signs, what other tools can be used in the ED to assist in early recognition of PFT? Point-of-care ultrasound is a quick and non-invasive way to help distinguish PFT from other conditions such as cellulitis or abscess, and ultrasound can guide appropriate management (7-9). Ultrasound appears to be sensitive study for detecting PFT (10, 11) and may actually be more sensitive than clinical exam in detecting tenosynovitis (12, 13). Although radiographs are typically ordered to evaluate for bony abnormalities or foreign body, ultrasound has the added benefit of detecting radiolucent foreign bodies. Figure 4. 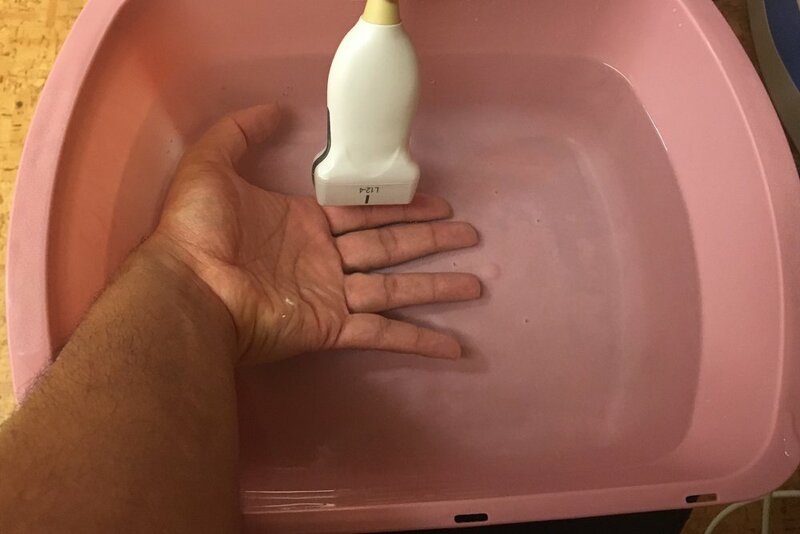 Water bath technique for ultrasound of the hand. Step 1: Fill a large basin with warm water. Step 2: Have the patient submerge their hand in the bath. Step 3: Float the linear transducer in the water above their hand and direct as needed. Since the water bath acts as an acoustic medium, the probe does not need to be in direct contact with the hand—and your patients will be grateful if they have any tenderness. Figure 5. 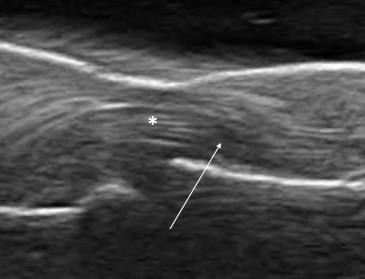 Normal flexor tendon anatomy on ultrasound. Anechoic or hypoechoic fluid within the tendon sheath and thickening of tendons are highly suspicious for pyogenic flexor tenosynovitis in the appropriate clinical context. Compare this with the cobblestone appearance of cellulitis on ultrasound. Figure 6. Cellulitis. Note the cobblestone appearance caused by subcutaneous edema. Figure 7. Example of anisotropy. Note the change in the flexor tendon from a hyperechoic signal (star) to a hypoechoic signal (arrow). Scan in two planes, and compare to the contralateral side if needed. Because of anisotropy, be sure to hold the probe perpendicular to the tendon in order to avoid mistaking tendon for fluid. False negatives can occur with ultrasound in early PFT when fluid accumulation is minimal, so clinical suspicion based on all information gathered should guide clinical management. Once PFT is suspected, it is important to initiate empiric antibiotic therapy—commonly vancomycin and/or piperacillin/tazobactam—to improve clinical outcomes (14). Elevate the hand to reduce swelling. Definitive treatment, however, is surgical incision and drainage, so early consultation of a hand specialist is also necessary. Cultures can be obtained in the OR and antibiotic therapy narrowed once speciation and sensitivities are determined. Although success with non-surgical treatment has been described, no studies have evaluated outcomes for PFT with antibiotics alone, and further investigation is warranted (14). The patient was started on vancomycin, and orthopedics was consulted. She was taken to the OR for an emergent incision and drainage that was notable for the release of frank pus from the index finger flexor sheath as well as murky fluid in the palm. Piperacillin/tazobactam was added, and the patient showed gradual improvement in erythema, swelling, and range of motion throughout her hospital course. Speciation and sensitivities revealed methicillin-sensitive Staphylococcus aureus (MSSA), and antibiotics were narrowed. The patient was transitioned to oral antibiotics and discharged on post-operative day #4 with orthopedic follow-up. Pyogenic flexor tenosynovitis can result in significant morbidity and is a surgical emergency. Tenderness along the flexor tendon sheath. Point-of-care ultrasound is a helpful tool in distinguishing PFT from other causes such as cellulitis or abscess. Consider using the water-bath technique to image the hand. 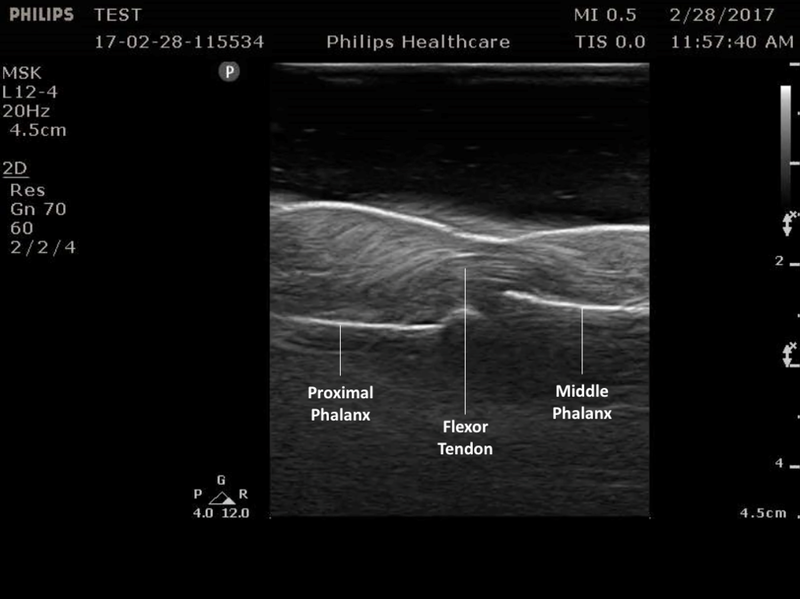 Look for hypoechoic or anechoic fluid within the tendon sheath or thickened tendons. If PFT is suspected, start broad-spectrum empiric antibiotics, splint and elevate the hand, and consult a hand specialist for possible operative management. (1) Weinzweig N, Gonzalez M. Surgical infections of the hand and upper extremity: a county hospital experience. Ann Plast Surg. 2002; 49(6):621-7. (2) Glass KD. Factors related to the resolution of treated hand infections. J Hand Surg. 1982;7(4):388-94. (3) Pang H-N, Teoh L-C, Yam AKT, et al. Factors Affecting the Prognosis of Pyogenic Flexor Tenosynovitis. J Bone Joint Surg Am. 2007;89(8):1742-8. (4) Kanavel AB. Infections of the Hand. 1st ed. Philadelphia, PA: Lea & Febiger, 1912. 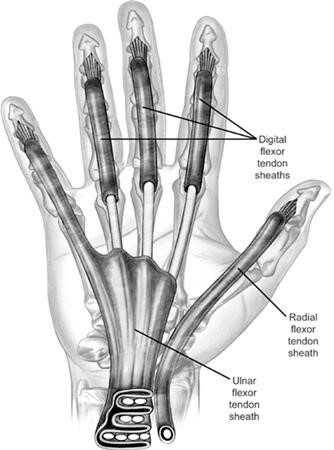 (5) Draeger RW, Bynum DJ Jr. Flexor Tendon Sheath Infections of the Hand. J Am Acad Orthop Surg. 2012 Jun;20(6):373-82. (6) Kennedy CD, Huang JI, Hanel DP. In Brief: Kanavel’s Signs and Pyogenic Flexor Tenosynovitis. Clin Orthop Relat Res. 2016;474(1):280-4. (7) Marvel BA, Budhram GR. Bedside Ultrasound in the Diagnosis of Complex Hand Infections: A Case Series. J Emerg Med. 2015;48(1):63-8. (8) Padrez K, Bress J, Johnson B, Nagdev A. Bedside Ultrasound Identification of Infectious Flexor Tenosynovitis in the Emergency Department. West J Emerg Med. 2015;16(2):260-2. (9) Cohen SG, Beck SC. Point-of-Care Ultrasound in the Evaluation of Pyogenic Flexor Tenosynovitis. Pediatr Emerg Care. 2015;31(11):805-7. (10) Schecter WP, Markison RE, Jeffrey RB, Barton RM, Laing F. Use of sonography in the early detection of suppurative flexor tenosynovitis. J Hand Surg Am. 1989;14(2 Pt 1):307-10. (11) Jeffrey RB Jr, Laing FC, Schecter WP, Markison RE, Barton RM. Acute suppurative tenosynovitis of the hand: diagnosis with US. Radiology. 1987;162:741-2. (12) Hmamouchi I, Bahiri R, Srifi N, Aktaou S, Abougal R, Hajjaj-Hassouni N. A comparison of ultrasound and clinical examination in the detection of flexor tenosynovitis in early arthritis. BMC Musculoskelet Disord. 2011;12:91. (13) Alcalde M, D’Agostino MA, Bruyn GAW, Möller I, Iagnocco A, Wakefield RJ, Naredo E. A systematic literature review of US definitions, scoring systems, and validity according to the OMERACT filter for tendon lesions in RA and other inflammatory joint diseases. Rheumatology. 2012;51(7):1246-60. (14) Giladi AM, Malay S, Chung KC. Management of acute pyogenic flexor tenosynovitis: literature review and current trends. J Hand Surg Eur Vol. 2015; 40(7):720-8.